The time right before a war begins must be a strange time. The rise of international tension is unbearable, and the uncertainty, too, renders people afraid but vigilant. Alfred Hitchcock’s pre-war thriller Foreign Correspondent is set from August 1939 to the outbreak of WWII, and deals with the pre-war intrigue through the lens of journalism. The film depicts the need for relentless reporting in the time of war, while also crafting a twisty espionage plot. Loosely based on Vincent Sheean’s autobiography Personal History, Hitchcock’s film was written by Charles Bennett and Joan Harrison, with additional dialogue by Robert Benchley and James Hilton. Behind the camera was cinematographer Rudolph Maté, with editing by Dorothy Spencer and music by legendary composer Alfred Newman. Joel McCrea stars as John Jones, a crime reporter for the New York Globe, who is surprisingly appointed the paper’s foreign correspondent. 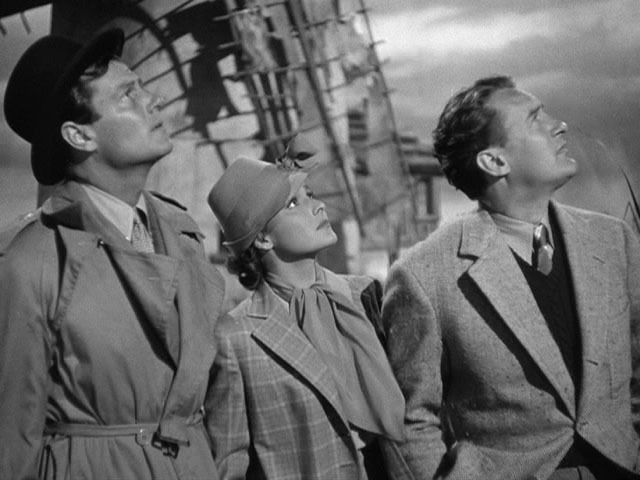 Jones, given the pseudonym Huntley Havenstock, is sent to London to find Stephen Fisher (Herbert Marshall), who is throwing an event in honor of Dutch diplomat Van Meer (Albert Basserman). Jones meets Fisher’s daughter Carol (Laraine Day) at the party, though Fisher informs the guests that Van Meer suddenly cannot attend. Jones then goes to Amsterdam where Van Meer is expected to speak at a political party. Jones however witnesses Van Meer’s assassination. In pursuit of the assassin, he links up with Carol and another reporter Scott ffolliott (George Sanders). Together they race to solve Van Meer’s murder and discover why he was targeted. The first thirty or so minutes of the film are a rather taxing stretch and tedious to watch. The pace is sluggish until Jones makes it to Amsterdam. However, the assassination and the subsequent chase are positively thrilling, with Hitchcock using rain and umbrellas to great effect. Dorothy Spender’s tight editing emphasizes Hitchcock’s careful staging. The sequence is the first of many exciting, elaborate set pieces that highlight Hitchcock’s command over his craft. For me, the plot is not anything too special; it’s your typical ‘average Joe gets entangled with international intrigue’ story in the vein of The 39 Steps and North by Northwest. The real delights of the film are the individual sequences themselves: Jones escaping enemy spies in his hotel room, Jones sneaking around a windmill, and an assassination attempt atop Westminster Cathedral tower. These crisp, suspenseful moments bring Foreign Correspondent’s dull plot to life. The climactic plane crash in the ocean is astonishing in its technical ingenuity and brilliance. Hitchcock projected a plane diving into the ocean onto a rice paper screen. The screen would be broken by water coming through chutes to simulate the plane crashing into the ocean. I wonder if Christopher Nolan was influenced by Foreign Correspondent because this film reminded me of Nolan’s own WWII epic Dunkirk. The struggle for survival and people working together to save each other really makes the climax work on an emotional level, in addition to its visual panache. Hitchcock wanted Gary Cooper for the lead role, but the actor turned down the role because he thought thrillers were beneath him (Cooper later regretted that). Known for Preston Sturges comedies and The Most Dangerous Game, Joel McCrea is tough, quick thinking, and a believable outsider. Hitchcock also wanted to cast Joan Fontaine, but Laraine Day’s innocence and intelligence sell the character. Of the supporting cast, George Sanders makes an impression. I liked the detail of his last name Ffolliott, losing a letter for a dead relative. Foreign Correspondent was nominated for six Academy Awards, including Best Picture. The film lost to Rebecca, also directed by Alfred Hitchcock. The film also lost all of its nominations, including Best Original Screenplay, Best Cinematography, and Best Supporting Actor for Albert Basserman. I can see why such a viscerally exciting film would appeal to Academy voters. The film has a heart and vigor to it that overcomes its uninteresting narrative. The whole experience ties itself together so well in its final act. The last scene, with Jones hurriedly giving a speech over radio to America while London is bombed, is beautiful. Mate’s lighting and the passionate dialogue (“keep the lights burning”) give the film a tragic but heroic ending. Foreign Correspondent is now streaming on FilmStruck.